Among slot enthusiasts, you will find many people who love the futuristic ones with blinking lights and hi-tech appeal. But there is another constituency who love anything to do with history and talks of times bygone. For the second category, WMS Gaming brings us a medieval themed slot game called Knights Keep which will give you a taste of simpler times. When you begin playing this game, the first thing that will strike you is the unique shape the reels are arranged in. Imagine a pyramid made by you from wooden blocks, and then the whole thing falls on its side. Knights Keep has the number of rows increasing towards the right, which is not something we have seen in too many before. Zeus III is one earlier game that immediately comes to mind. 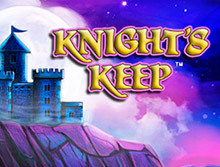 Knights Keep slot has six reels and 192 different ways of winning. We already told you that the number of rows keeps increasing, and is not fixed. The royalty of yore used to look down on commoners. One thing we didn’t like in this game is that it doesn’t seem to encourage newbies. The minimum bet starts from 40p. The maximum bet of £200 is also a bit biased towards the big players. This game does have a jackpot, in keeping with its haughty minimum and maximum bets. The RTP of 96.01% is good enough to keep the big players interested. Apart from the jackpot, there are several offerings which help to drive up the RTP. WMS has been known for its realistic land-based slots in the past, and this one lives up to those high standards. The medieval theme allows a lot of nice artwork to be used. An impressive castle with a full moon rising behind it forms the backdrop. Because of the theme, most of the symbols signify palace intrigue and royalty. The lower value symbols are the playing card symbols. You will find them in distinctive colors like red, blue, purple, and pink. Here you will find spades, diamonds, clubs, and hearts. There are other symbols which offer much higher value returns. There is the King and the Queen, of course. They are accompanied by the court jester. You also have the symbols of royalty, like the crown and the scepter. Last but not the least, in keeping with the name of the game, there are knights as well. The Knight offers the biggest payouts. You can even win 10x your wager amount if you get 6 in a row. The Knight is the Wild symbol for this game. You can use it to substitute for all other symbols except the Scatter. The Scatter Symbol is represented by an artistic representation of a horsehead in gold color. 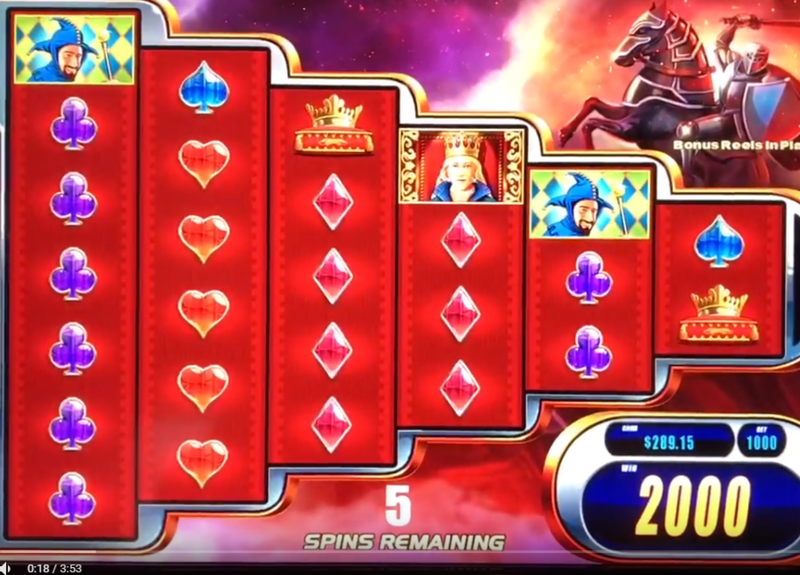 This game has a special feature of replacement of symbols in reels after every spin. This flipping of the reel set improves your chances of winning greatly. Players have reported that due to this, they have also ended up with King Symbols on all reels and rows, for example. The bonus rounds in Knights Keep are even more interesting because of the unique shape of the reels we spoke about earlier. When you are plating the free spin bonus rounds, at one end there are just two rows and on the other end, there are seven rows. This will make it easier for you to form the winning combinations. As you repeat the bonus free spins, the Scatter symbols will be seen only on the inner reels (first to fifth). The maximum number of free spins you can get is 100. When you get 3 or more Bonus symbols on any of the reels from the second to the sixth, you not only get the additional free spins we mentioned above. They also come with multipliers. So 3, 4, and 5 Scatter symbols will get you returns of 2x, 10x, and 50x respectively. As we said above, every spin is accompanied by a random changeover of the reels. We felt this slot game ticked most of the boxes we were interested in. The graphics and look were quite interesting and attractive. The reel arrangement and the random flipping of reels kept us curious and interested. Finally, the winning was the most attractive feature for us. Don’t be misled by the RTP we quoted above. This game allows you to win more often than you would think, looking at the RTP. The similar game we named earlier in this review might have gained immense popularity and top of mind recall. But Knights Keep takes the bar higher in that genre.